We can’t help screaming ‘Ay, caramba’, a Spanish phrase, favoured by one of our favourite animated characters, Bart Simpson, when visiting this site. But that’s where the comical antics ends as the site actually offers an array of quality games and a service which shouldn’t be laughed at. Established in 2005, the site has only recently come to the forefront of the iGaming industry since they rolled out games by Net Entertainment, though their array of keno varieties are all by NeoGames which are still of high quality. Note: As of 2017, Karamba no longer accepts players from Australia. The information on this page is intended for an international audience only. Promotions can make or break an online casino and this keno-dense site has a substantial amount for the average player. For player’s who think the larger the bonus the better should know that in actual fact unless you are planning to deposit a huge amount, the smaller the bonus, the better. This is because it generally requires less deposits and less time to release it as cash. So a smaller deposit bonus is preferred and Karamba offer a single deposit of up to $200 matched by 100%, making it easier and quicker to access the bonus (others can take over a few deposits). You do have to remember to use the code KAR100 when making your first deposit however, and there is a 35x wagering requirement before you can release the bonus as actual cash, which can be completed by playing any of the keno titles mentioned below. Along with the matched deposit, you receive 20 free spins on the same day, then 40 free spins on day two, and finally another 40 on day three and even a special surprise bonus to go with day three’s free spins. You do have to deposit a minimum of $20 on day two, and then make another deposit of at least $20 on day three to release these free spins however. 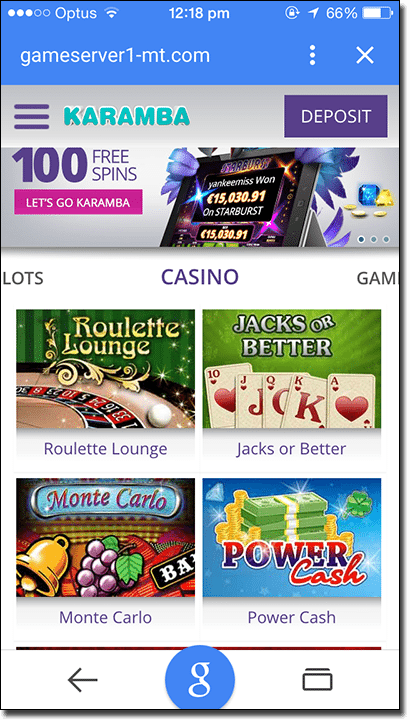 Loyalty bonuses: Karamba awards their loyal players with regular cash back promotions as well as bonuses including free gifts and giveaways. Monthly promotions: Check the Karamba promotions page regularly for their month specific promotions. Here you can win free spins, free cash, and even prizes that includes trips and cruise vouchers, chances to win gifts such as the latest gadgets, and more. Mac players will be excited to know that Karamba only offers an instant play version so regardless if you have an Apple device or a PC you will still be able to access the site. This is great for players who also don’t have enough storage space on their desktop to download the flash version as they can still access Karamba’s entire catalogue via their browsers, including Google Chrome, Firefox, and Safari. Karamba use a variety of software providers, though initially they launched with just NeoGames but have since rolled out an array of games by Amaya, and the very popular software provider Net Entertainment. The layout design is quite basic, but made more interesting with the bright colour scheme and interesting bird graphics that are playing all of the popular titles available at Karamba. Players can easily navigate around the site and view all the games without logging in, with the main menu panel offering the links ‘Home’, which sees a sub-menu featuring all the game categories including ‘Most Popular’ games, ‘Video Slots, ‘Casino’, ‘Games’, ‘All Games’; as well as ‘Promotions’; ‘Mobile’; and ‘Demo Play’, where you can try out the games for free before signing up. Once you have signed up the games lobby will appear which is also easy to navigate around. 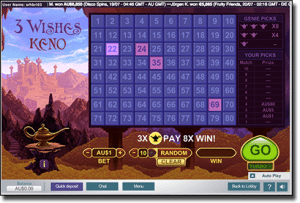 There are three main categories including; ‘Slots’, which includes the subcategories of ‘Video Slots’, ‘Classics’, ‘Scratch Slots’, ‘Jackpots’, ‘Recent Games’ and ‘New’ games; ‘Casino Games’, which includes the subcategories ‘Most Popular’ games, ‘Table Games’ , ‘Video Poker’, ‘Slots’, ‘Instant Bingo’, and ‘Instant Games’; and finally ‘ScratchCards’, which includes the subcategories including ‘Most Popular’ games, ‘Instant Games’, ‘Classic’, ‘Fantasy’, ‘Casino Scratch’, and ‘Sports’. At the bottom of the games lobby your balance will appear, as well as a ‘Quick Deposit’ option, so you can top up quickly once you have already made a deposit; a ‘Cashier’ option, which takes you directly to the banking page; a ‘Menu’ tab, which offers links to all of the games, terms and conditions, their support page, and more; and finally a ‘Chat’ link where you are taken to a window to chat to a customer service representative live, which we discuss below. On the side panel there is search box and a ‘Contact us’ link where you will be taken to all support options available. 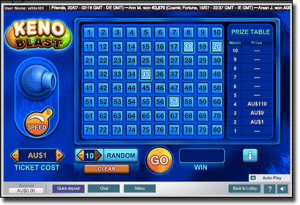 Keno can be bit harder to locate in comparison to slots, table games, etc, at Karamba casino but you can either find the titles under the ‘Most Popular’ categoy under the main ‘Casino’ games category or you can simply enter ‘Keno’ into the search bar. 3 Wishes Keno: 3 Wishes Keno is a variant of the standard keno title and offers a 4x multiplier for landing two genie symbols, and an 8x multiplier for landing three genie symbols. Disco Keno: Disco Keno is a mix between both keno and bingo and to win you need at least one winning card with at least two matching numbers on each card. KENO: A more standard keno title, KENO, offers players the chance to play a traditional style keno game without all the unique additions. Player can pick up to 15 numbers and bet up to $10 per number or ‘spot’. Keno Blast: Similar to a standard keno title, but only faster. Keno Blast offers players the chance to pick up to 10 numbers out of the normal 80 but the results are ‘cannonballed’ onto the grid and you can increase the speed to make it a high impact game. Keno Deluxe: Keno Deluxe is basically the same as KENO, the layout and colour scheme is just different. Try out both KENO and Keno Deluxe to see which one you prefer. Karamba’s catalogue is quite extensive and offers an array of popular casino games and slots, not just the most amount of keno titles we have seen at just one online casino. It’s also important to note that you cannot play any of these games in free play mode via the games lobby, rather you have to access them through the main homepage and click on ‘demo play’ on the title you wish to play in free play mode. Not all titles are available to be played in free play mode, however. Don’t fret if you have an older phone or another brand; most modern devices post-2006 can support Flash games out of the box (the technology used to play games like online keno via Web browsers on mobile) and even older devices can still play certain games using in-built WAP technology. Unfortunately, only Keno Blast is currently available from Karamba on our mobile devices so if you enjoy any of the other variants you will have to play them on your PC or laptop. There are a variety of slots, Roulette Lounge, and an array of video poker titles available for players who like other titles in-between keno sessions. Simply make a deposit and you can get playing keno straight away with most payment methods processing quite quickly. The majority of payment methods are also available to withdraw any winnings you may incur while playing the variety of keno titles on offer except MasterCard credit and Skrill. All transactions are incredibly secure, which can be proven by clicking on the padlock in the browser’s URL toolbar. Here you will see that the site uses modern encryption technology, specifically TLS 1.2, with a 128-bit key, meaning there is no way anyone can hack into the site and steal your details. Additionally, Karamba is licensed by the Malta Gaming Authority (MGA) which is considered to be one of the best licensers in the iGaming industry and represents that the site is reputable, trustworthy and fair. Another thing to note is the site automatically signs you out after a few minutes of inactivity, so if you are playing on a public device you don’t have to worry about someone being able to use your account if you accidentally forget to log out. While Karamba has a lot of support options, unfortunately they all aren’t available 24/7 which we think is a bit of a drawback to the site as round the clock support is pretty important. If the live chat or telephone service isn’t available you can shoot them an email and they aim to respond to queries within 24 hours.